Looking for a fun and a little gross Halloween Food idea for some Halloween Fun or a Halloween Party? 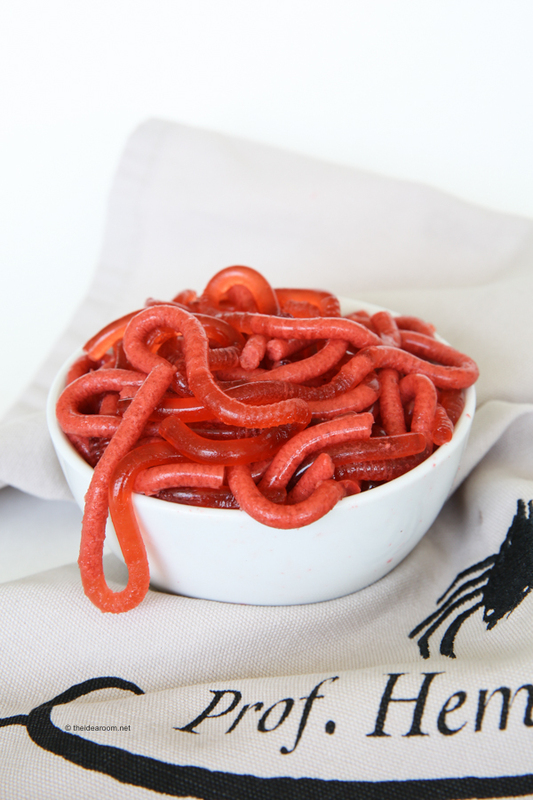 Check out these realistic and totally edible Halloween Jello Worms! 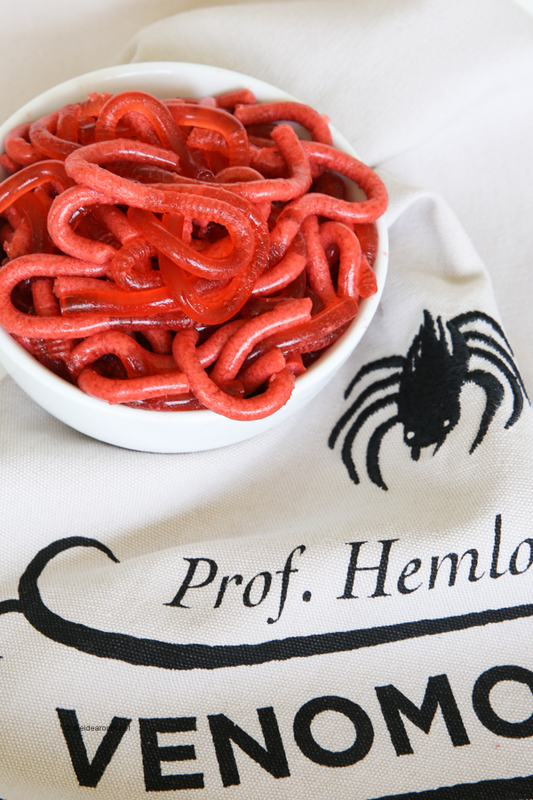 These edible Halloween Jell0 Worms are a BIG hit for our Halloween Dinner. The first time I served these up the kids really freaked out. My daughter couldn’t even look at them at first, but after some coaxing and a little good natured teasing, she ate one. Then much too her surprise, she liked them. They take a little effort to make, but I think they are worth it. Plan to make these at least a day ahead of time. 1. Combine gelatins in a bowl and add boiling water; stir until gelatins completely dissolve. Chill until lukewarm, about 20 min. 2. Meanwhile, gently pull straws to extend to full length; place in tall container. Wrap together with a loose rubber band to hold straws together. 3. 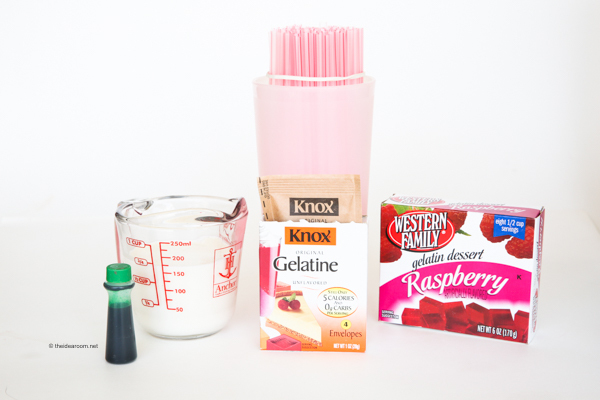 Blend cream and food coloring with the lukewarm gelatin mixture. Carefully pour into container, filling straws. 4. Chill until gelatin is firm, at least 8 hours, or cover and chill up to 2 days. 5. Pull straws from container or, if you’re using a carton, simply tear the carton away from the filled straws. Pull straws apart. Run hot tap water for about 2 seconds over 3 to 4 straws at a time. Starting at the empty ends, push worms from straws with rolling pin, or use your fingers. These Jello Worms take a little bit of effort but are totally worth it if you are looking to impress the guests at your Halloween Party! 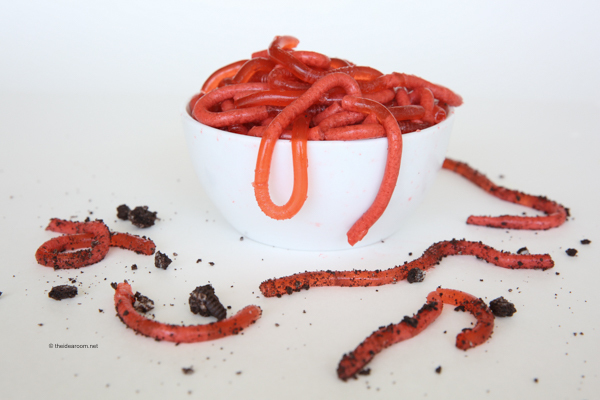 Add some crushed Oreos to make it look like your worms have been crawling through the dirt! Do you want my free Halloween Recipes eBook? Want to throw a fun Halloween party without all the work? Download these pre-made Halloween Party Labels, all you have to do is cut and assemble! Now back to the jello worms…I dare you to eat at least one! You might be surprised to find that you actually really like the taste of these…that is if you can get past how real they look. Try to use straws that have a bendy section. If you pull the straw all the way out at the bend, this gives your worms that extra little realistic touch! You may be interested in these adding these Halloween Party Games for Kids to your festivities too. Those are the coolest. I might have to try them. Wow those look so real I might have a hard time convincing myself to eat them :) I will definately be making them for our Halloween party this year! Those worms look real. I don't know if I would be too excited to try them myself:) I think I will have to try them this year! ok, I am DEFINATELY going to have to make these! I can't wait to make these! My kids are going to freak! My kids are going to FREAK OUT!!! I can't wait. So cool looking! Thanks a bunch. Oh, I'm totally going to be making these! FUN! Thanks Amy! 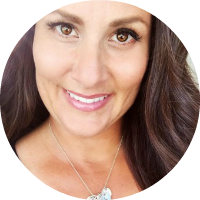 I have been following your blog for some time now and just had to say…..keep up the GREAT work! You are so creative and honestly, I'm a bit jealous :) I look forward to reading your blog whenever you have a new post! Thank you, thank you. These are awesome! I can't wait to try them!!! Whoa! Those are so gross and awesome at the same time. Thanks so much, I've gotta try this one. I'll be linking as well. Oh my gosh. Martha Stewart has nothing over on you when it comes to Halloween treats. This is so cool. Thanks to two magnificent contributors; correspondent Shaneia Caldwell and director of photography Roy Wanguhu. Thanks guys. 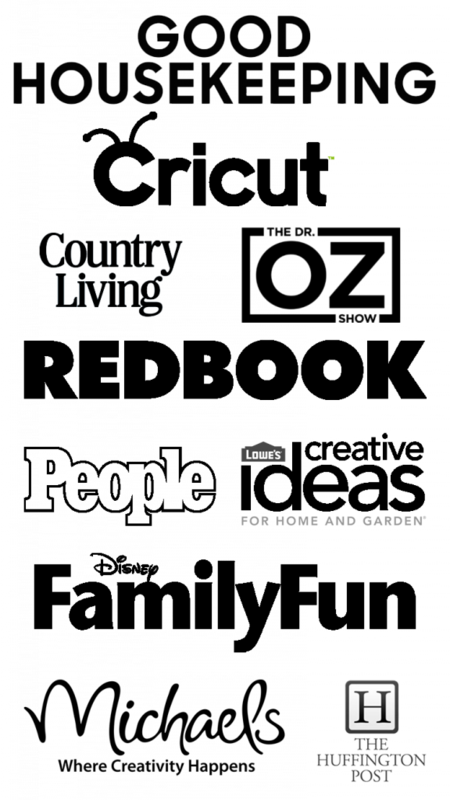 I cod8un&#l217;t have launched those great segments on Chic Spy TV without you!!! This is so disgusting, I love it! Even though my kids are older, I might try this anyway!! Question: How hard is it to pour the jello mixture into each of the straws? Any hints on that part? I made these and put a little of the jello mixture in the container, then added the straws and put in the freezer for about a half hour. Then I used a syringe to put the jello mixture in the straws. It worked really well. Wendy–glow in the dark paint can be found at most craft stores. I found mine at Roberts. Petit Debutant–I put my finished Jell-O mixture into a pitcher and poured it into the straws very slowly. I did get some overspill that just ended up surrounding the straws. I just broke it off after it was ready. You should be able to get most of it into the straws! It does get messy! My straws wouldn’t fill with the jello it just kept running out of the straws and filling the carton. After many attempts, i figured to fill as much as possible let it coagulate and then carefully remove straws from carton to retrieve the excess of the overflow and return the straws with coagulated jello into the carton and back in fridge ,simmer the excess in a pot. Let it cool and then fill the straws worked wonders for me. Perhaps next time i’ll just fill the carton with a 1/3 cup of jello liquid put the straws in and then fill, that way theres no liquid running any where. So gross! So awesome! Thanks for sharing this wonderful project. Those are sooooo gross looking but totally awesome! I'm going to have to try this! Amy, SO the jello doesn't run out the bottom of the straw?? We are hosting a Haloweenie Roast for the neighbors and think the kids will love these!! Leigh Anne–The Jell-O does run out of the bottom of the straws and gets quite messy, but there is still alot in the straws to make your worms. I made the worms and blogged about it here: http://mamabeefromthehive.blogspot.com/2009/09/worms-for-dessert.html thanks for the fun idea! OMG OMG OMG…I CAN NOT wait to make these….so gross! I absolutely LOVE these! We made these for the party we went to last weekend and they were a hit! So gross to make but delicious to eat! Thanks for posting them! These are so cool….to get around the time consuming task of filling each straw individually I just filled my container with the jello mixture then took my straws that were rubberbanded together and stuck them in there. I ended up using about 140 straws because that is how many I could squeeze into the container I used. I had some tall cylinder vases left over from a wedding…..all the straws were full with about an inch left at the top. There was jello that firmed up around each straw but I just wiped it off before I squeezed my worm out. A little less trouble and wracked nerves; ) thanks for the awesome idea…..my kids and the teachers LOVED it!! Amy, I loved this idea! I just had to try it and made some for my sister and her family for last Sunday dinner. They didn't look quite as good as yours, but they were still a hit! My 4-year-old nephew refused to eat them even after I told him they were just Jello. He thought I was kidding! I love it!!!! I just finished pushing the worms out of the straws. They look great. I am using them for the boy scout party tommorrow night!!!! I think I might go to the chinese food take out storeand get some of those clear containers. That is how real worms come if you buy them. I am so excited !!!! This is the most disgusting awesome looking edible things I have ever seen, I can't wait to serve them up. THANKS! I would definately NOT consider these edible. I would NEVER pour hot liquid into any kind of plastic to allow it to set and then feed it to anyone. When plastic heats up it leaches chemicals into food. These do look awesome, but as DECORATION ONLY. You are not pouring HOT liquid into plastic. You are suppose to let the mixture cool to luke-warm (room temp) prior to pouring it into the straws. 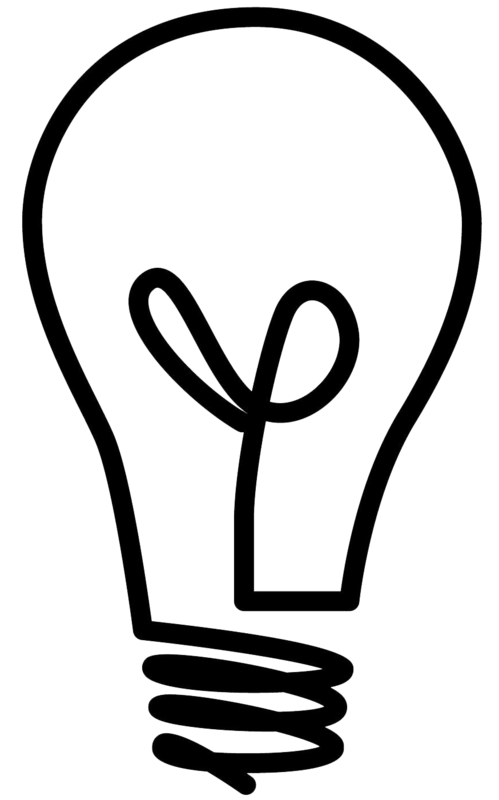 How creative are you! 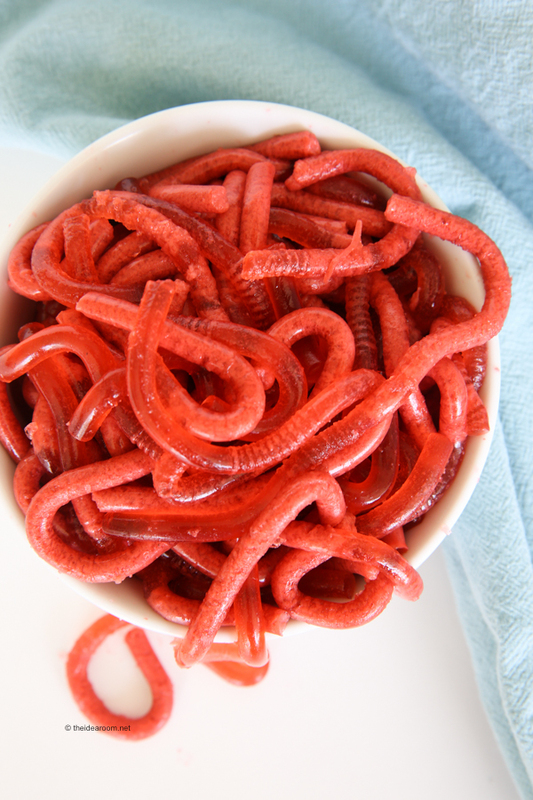 These Jello worms are awesome & they truly look like the real deal! want to try these for the party that we are going to. do you whip the cream? I was wondering if you use just regular jello without the cream would it work as well?? oh my gosh those are so cute! my kids would love them!! I featured these on my list of 10 Tricky Treats to make this Halloween! I am going to make a chocolate bundt cake tomorrow for our ward Halloween Party. I will then frost it with a dark chocolate and then dust with ground oreos and graham crackers for dirt. Out of the center ot the cake these great worms will crawl. Should be fun. Oh, that is so disgusting!! I can’t wait to try it!! We go to a friends for Halloween every year and she’s got three boys. Our families combined equals 7 boys. Don’t you know they will love these!! I found you through TCB. Cheers! The Skeleton Sweats are screamingly cool! Way fun! I just made them. I must say my coloring was WAY off. You must’ve not added any food coloring to get it so red, right? Next time I’ll definitely not add any extra color. Thanks! So, I used these instead of Jell-o shots at my adult Halloween Party! They were a hit! We made 150+ and they were gone quick! We used Raspberry Jell-o and Black Cherry Vodka and they were delish! (in the recipe just changed it to 1 1/2 cups boiling water, stirred in until gelatin was completely mixed, let chill, then added 1 1/2 cups vodka. Kept everything else the same and it worked perfectly!) Thanks for the idea!!! I made these for my sons birthday party and they turned out fabulous! The taste was amazing and they looked so real. I crushed up some Oreo shells for a look of dirt. Mind didn’t turn out two-tone though. They were all one uniform color that was more of a creamy color. Still very realistic, but I was wondering how you got the two-tone colors. Also, I didn’t try to fill each straw with the jell-o mixture. Instead I filled the container with the mixture and then placed the straws in afterwards. The liquid still rose to fill each straw. Has anyone found an effective trick for getting the worms out of the straws? Mine are not coming out well and keep breaking! Okay… I want to make these but thought of an “enhancement” …. oreo cookie crumbs make great dirt to sprinkle on the worms. I am going to the closest bait shop to see if I can get a plastic bait container to serve them in… tee hee can’t wait. We made these for my grandson’s Halloween party, and like a lot of comments above, kids (even adults) were afraid to eat them at first. But once they tasted, they loved them. My grandson’s mama found the idea on pinterest and tried a lot of other good things as well. We had fun. We experimented several times finding ways to get the jello inserted. Using a pitcher as tall as the straws finally worked successfully. The worms really look creepy! Perfect for the party. Place ice in a container below the jello worm plate and the jello will keep its shape just fine. I made them last year and they turned out great, but I had given myself plenty of time to make them so this year I don’t have as much time as I started on them already. So my question is…why do you have to wait 8 hours for them to chill? Do you think they will turn out just as good in 4 hours? Just made these and they are look just great. I thought they hadn’t worked at first but when I started squeezing them out I found I was wrong cos they look just like the picture (which never happens when I cook). cant wait for the kids to see. Have a horrible haloween everyone!! We tried these a couple of weeks ago and they are really cute and kids love them. i wanted to add some thing to add a gritty texture to make them seem more like actual worms. any ideas? tried pears pureed in the mix but it turned out mushy and didn’t feel like eating dirt with the worms. I’m a little sad I didn’t think of this first. What a brilliant idea! Thank you for your creativity and sharing it with the rest of us! I can’t wait to see my friends’ reaction to these. Ha! I hope they are sufficently impressed and grossed out at the same time. um,yeah, these didn’t work out,at all. I did everything you suggested and the jello did NOT want to come out of the straws. I ended up tossing the whole batch. So at what point do you add the jello? I think you missed a step. Do you add that to the cream/gelatine mixture? Can these be made without the unflavored gelatins? Please answer as soon as possible, thank you! Can you add vodka to this ? Jody- I have not tried that, but I am sure you can.